What I Do On Exam Days! I think everyone knows how horrible and daunting exam days feel, so I thought I’d share some tips with you for what I do and how I cope. Some tips may help you so if you find them useful that’s great! Make sure you leave yourself plenty of time to get to your exam. When I was doing GCSE’s at school, I found it easy to time manage because if my exam was in the morning, I’d either walk with a friend or my Mom would give me a lift. If I had an exam in the afternoon, if I wasn’t on study leave, I’d already be in school and me and my friends would walk to the exam together. Now, doing A-Levels at a college in the city centre is a bit of a stressor. I have to rely on the bus to get me there, so a morning exam is hell as I have to leave super early to get there on time. Especially since my exams are not even in my college building! Make sure you eat before your exam! To fill my stomach, I usually have a bacon baguette as it’s the quickest thing to make that will actually fill me up quite a bit. There’s nothing worse than your stomach rumbling in a silent exam. It always happens to me. After eating the bacon baguette at home, whilst walking to the exam with my friends I’ll eat a bar of Bournville. During exams, I always get scared I’ll fall asleep or get a headache, so I have to take one painkiller (just in case) and one Pro Plus. If I don’t do this, I’d probably think about it for the whole exam. On exam days, I never wear make up as I’d probably end up smudging it all over my face. This is just a personal preference, I also tie my hair into a bun right on the top of my head so no hair goes near my face whatsoever. Finally, when I’m sat down in the exam I block everyone out and try to keep calm, maybe by taking a few deep breaths. These are just some things I do on days I have exams! 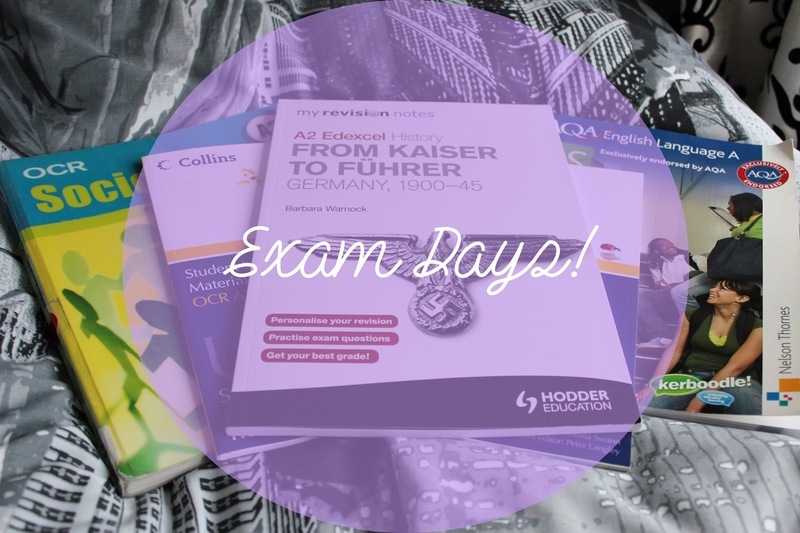 Let me know in the comments below what you do on exam days?